The Autobots unite with Titan Master partners to power up for battle! Autobot Infinitus slows time so Sentinel Prime can unleash precision attacks even when battle is raging at full fury. Are you sick of cowardly politicians who tell you it's wrong to blame "all Decepticons" for terrorist attacks even though Trypticon just ate your home town? Have you had enough of so-called progressives calling for beast-mode acceptance, unchecked immigration from the colonies and the complete removal of functionism? 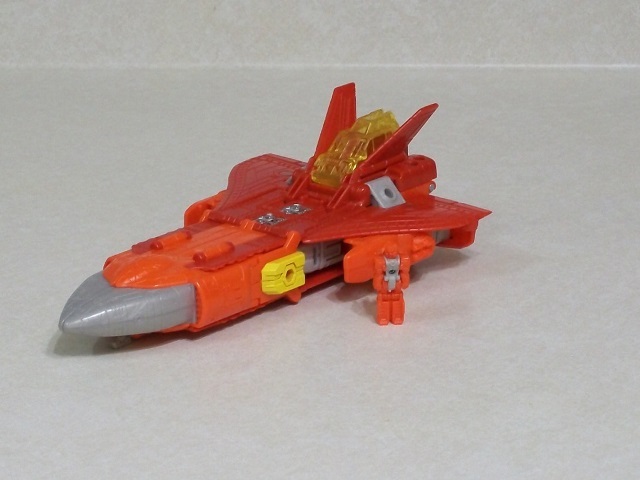 Do you want a return to the Golden Age, when there was Energon in every pot and a good job for everyone with a useful alt-mode and the willingness to work? Have you had enough of skyrocketing taxes and ineffectual government, watching the Quintessons and the Skuxxoids beat us on trade deals while Leo Prime and Ultra Mammoth jet-set around the world for photo ops? And just who IS Leo Prime, anyway? Is he even Cybertronian? He turns into a LION. That's not an Autobot alt-mode. I'm not saying he was built on Eukaris, but there's a reason why he won't release his manufacture certificate! What's that? No, you can't see my tax returns. Don't be silly. We're losing, people! Our planet used to be great, but it's a shadow of our former self. Aliens come here and steal half our jobs, and the other half get shipped off-world to planets that pay their workers half a shanix a day. Our army is a joke. Tarnian street rats attack us with impunity and we do NOTHING. But it doesn't have to be this way! Follow me, and we'll make Cybertron great again! We'll stop being losers and start winning. We'll win so much that you'll be sick of winning! People are going to come to me and say "Sentinel, just let Megatron have this one. I feel bad for him." And then I'm just going to win again anyway! I'm going to find Megatron and punch Doomshot right off of his shoulders, and then I'm going to track down Galvatron and shove that shiny new jet-mode of his up his fusion cannon. And people hear this and they say to me "Sentinel, what can I do to help?" EASY! You can buy my new action figure and put it on prominent display. That way, everyone will know you're willing to do whatever it takes to make Cybertron great again! Shuttle Mode: If it wasn't bad enough that Hasbro got Camien engineers to design their actual figure, they pay Quintesson factories to manufacture them! When I'm in charge, companies that take jobs like that away from good, working-class Autobots are going to have to answer to ME. And if saving a few shanix by betraying Cybertron wasn't enough, they barely painted me! In fact there isn't a single paint application on my entire figure that's there to add detail in shuttle mode. 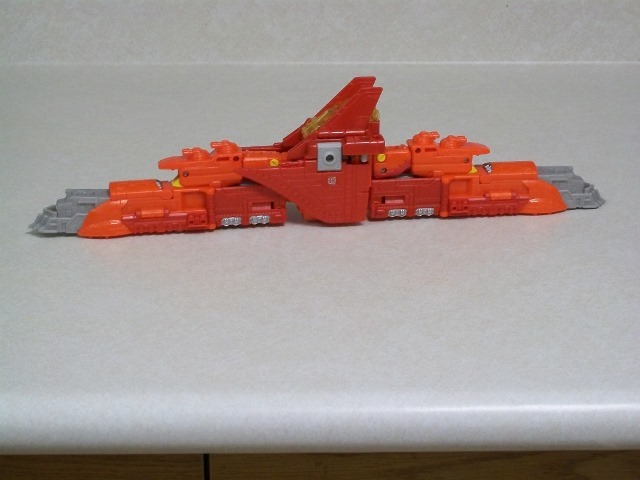 My entire body is bare red and orange plastic, except for my transparent yellow cockpit and a handful of details that carry over from train or robot mode. At least they tampographed tiny Autobot symbols to my wings. Hasbro thinks they can get away with this. WRONG! The sculpting of my figure is well-done, but with no paint and the colours they chose, you can't see any of it! To make matters worse, I have to share a body with the Decepticon scum traitor Astrotrain and people say he looks better than me! When I'm in charge we'll investigate and get to the bottom of those lies! My shuttle mode might be covered in unpainted windows and gun turrets but there's no way a Decepticon looks better than me! ...what? No, I don't think my turrets are small! They're the perfect size! And even if they weren't, I have two really big, impressive cannons that I can mount all over. The Decepticons won't know what hit them! And I have plenty of room for other Titan Masters to dock as well, even though they don't want to for some reason. The losers who say I look like an unpainted prototype cast in random colours so that the factory workers won't try to sell it on eBay don't know what they're talking about. SAD! Train Mode: So Senator Sky Lynx says we're not going to build a wall and deport the Minicons, even if I'm elected? WRONG! I don't need to BUILD a wall, I turn into one! I'll just roll down to the border and keep them out myself. Oh sure, I'm 500 feet long and 200 feet tall with no joints between cars, so I can only roll on a completely straight track with no curves at all. And I've got even less paint visible here than in shuttle mode. But at least some of that paint is MEANT for this mode. Even if the Hasbro losers only painted half of my wheels. I'm still orange and red, with bits of grey here and there. And I still have lots of places to dock my guns. And I still have lots of detail that no one bothered to paint. Worse, lots of my train mode is made out of flimsy panels that fold into and over my legs. They wouldn't last long if you let a child play with me. No, we're not here to talk about my teen beauty pageants, and those femmes are lying anyway. I mean, look at them! I don't think so! Besides, what's more important is that some of my panels are bent and warped right out of the box. This would never have happened if Autobot workers were allowed to manufacture me! Autobot engineers wouldn't have left half a space shuttle hanging off of the middle of the train either. Even I can't think of anything good to say about this mode. SAD! Robot Mode: The leader of the Autobots needs a strong robot mode! A robot mode strong enough to stand up to Sixshot or Overlord! Strong enough to turn back the beasts and the combiners and the colonists! Losers will say that I'm ugly or badly engineered or have poor articulation, but don't listen! They're spreading FAKE NEWS from the lying media. Honest sites like prowl.com tell it like it is: Sentinel's robot mode is great just like Cybertron will be again! I'm mostly orange, but with with lots of red and grey too. Also PAINT APPS! Yellow paint apps and some silver. 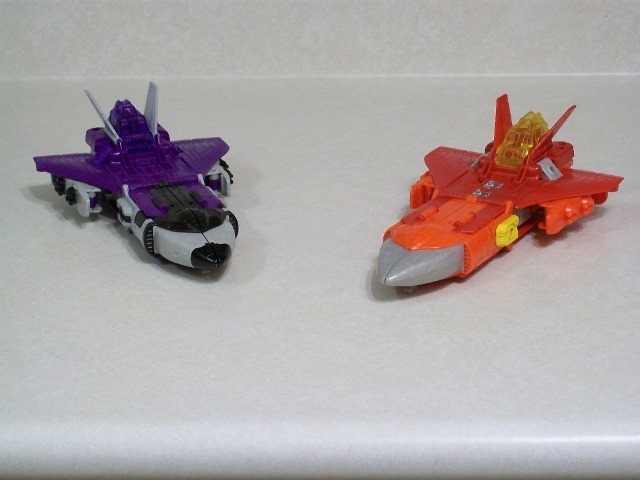 But only half as many as that EVIL Decepticon Astrotrain got. More bias from corrupt Hasbro! They want Lying Starscream to win! But have you seen what's in his emails? Maybe if Rook reported on this and told the truth, his network wouldn't be going under? Losers like to say that I've got badly-designed legs, that my shins are three times as long as my thighs and that it's almost impossible to do anything with my lower body because my legs are only a hair shorter with my knees completely bent as they are totally straight. Or that the lack of a waist swivel or ankle tilts for my ridiculously large feet are a problem. WRONG! I can do at LEAST three different poses! 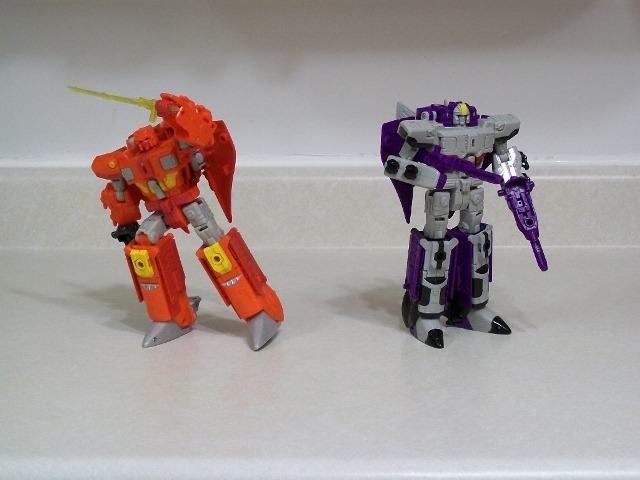 And my arms have totally normal articulation that isn't hindered at all by the vexing wings that I inherited from that bad hombre Astrotrain. And sure, one of my rifles is a chair with a gun taped to it, but you almost don't notice if I tape both of them together! Besides, I look much better with Optimus Prime's sword. He's such a weak leader that he let me take it! How can you trust a mech like that? I mean he literally founded the Decepticons! If it wasn't for him Megatron would have died in a cell! Some people like to pose me with my cannons shoulder-mounted, but those are bad people or weak minds led astray by IDW's LIES. Some other losers think that my head is too small, so they pop out the little spring-loaded towers on either side of my head to give it bulk. Don't do it! My head is fine as it is. Don't fall prey to vain degeneracy like Astrotrain did. You may have heard that my Titan Master port is too tight, and that people have ripped the heads off of their Infinituses trying to separate us. Sadly, this is true. Many such cases! 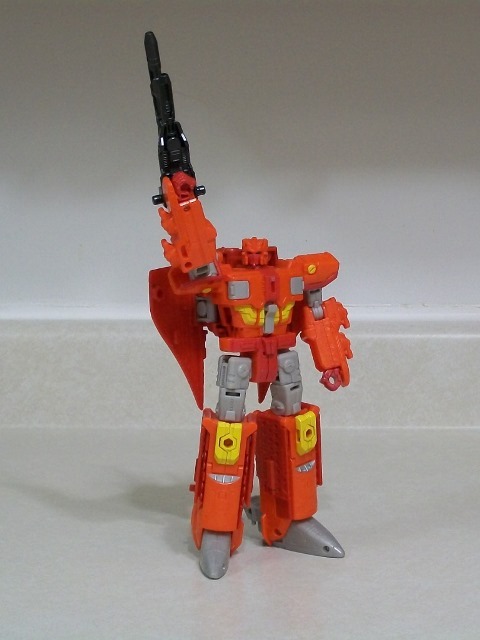 THIS is the robot mode that will lead Cybertron back to its former glory! Now raise your right arms and say it with me: make Cybertron great again! Titan Master: Infinitus is mostly irrelevant, but he does provide me with the handsome face that I use to get across my message so he's not all bad. 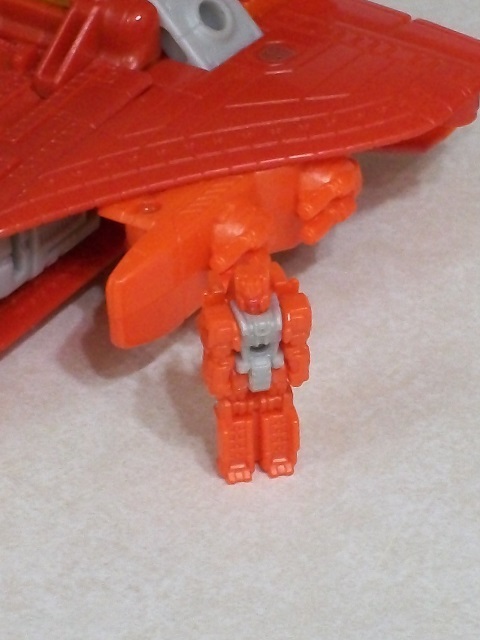 His robot mode is orange and grey like mine, with the same joints as every other Titan Master out there. His faceplate is painted too, though the colour is so close to the plastic colour that you probably won't notice. His head mode is what actually matters though, since it's my head. It's based on the head that puny flesh creature Alex Milne designed for me when he scribbled the art for the dire pro-Decepticon propaganda rag "Megatron Origins". The story told in those pages was nothing but transparent lies spread by the biased, Decepticon-loving organization IDW! When I get the Matrix back we won't stand for that type of slander, and fake news outlets like IDW will be BANNED from the Great Dome! But they did draw me well. Of course, Hasbro's shanix-pinching means that my forehead crest isn't painted like it should be, but at least I have the features of a leader, not like that low-energy loser Ultra Magnus!